The most-uttered phrases at APEX this year including the expected “surface mount,” and “BGA,” and the like, but another vocabulary set is rapidly gaining traction with exhibitors and OEM/EMS attendees. “Solar cells” and “photovoltaics” were on many people’s minds, as the mature SMT industry reaches into the emerging markets available to exchange information and develop processes. Solder suppliers, printing companies, chemists, and oven manufacturers are a few of the companies promoting solar manufacturing technology for the electronics manufacturing crowd. Electronic Trend Publications (ETP) reports that capacity of photovoltaic modules (panels) sold in 2008 exceeded 4.9 gigawatts, a nearly 25% increase over 2007. The market is expected to grow to more than 15 gigawatts in 2013 and 44 gigawatts by 2023, and be a leading vertical market for product assembly for both OEMs and CMs, ETP notes. The factory cost of producing photovoltaic modules was $9.8 billion in 2008 and will grow to $52 billion in 2023, a compound annual growth rate of 11.8%. Photovoltaic cell producers are looking to outsource module assembly to capable industry suppliers and EMS providers. Outsourcing will grow to 4% in 2013 and 25% in 2023, as OEMs seek a competitive cost advantage, ETP predicts. Virtual Industries, which makes vacuum tweezers for handling components and wafers, offers custom applications for the solar market. Many customers will purchase vacuum handling tips to integrate into automated systems, making handling equipment an easy retrofit from electronics components to solar wafers. Retrofits are also an option for dispensing systems, and companies like Techcon Systems, a division of OK International, are expanding into the photovoltaics manufacturing sector. “We’ve had three successes for valves and pumps in the solar market in the past six months,” noted Bryan Gass, VP of the OEM division at Techcon. In the field of metals and chemicals, distributors like K.R. Anderson Inc. see solar as a yet-untapped manufacturing market. It is the future of our industry, and yet a great deal of companies entering the photovoltaics manufacturing market don’t have a solid understanding of the materials involved, said Jeff Wagner, sales manager, K.R. Anderson. As a distributor with a narrow focus — carrying less than 10 core lines — the company feels it can partner with materials suppliers and new solar customers to understand and troubleshoot problems and develop easier to use, better performance products. This requires an investment in technical staff that is difficult for assemblers facing tight margins and reduced personnel resources, added Wagner. This “middle man” position of the distributor actually can benefit the electronics assembler, much like an outsourced R&D/failure analysis lab. Major equipment manufacturers also are pointing electronics manufacturers' attentions to familiar equipment with applications beyond PCBs and ICs. Assembléon, a capital equipment supplier, is immersing itself in the green energy concept, from its own machines to the products its customers manufacture. Among the promising innovations is the YGP screen printer, which uses a servo-controlled single-sided squeegee blade. This design keeps solder paste in front of the stencil at roll-in, which reduces sheer and maintains solder paste composition. This technology will prove beneficial for solar cell manufacturers trying to achieve taller, narrower metallization fingers on solar cell surfaces. By preserving the integrity of the metal materials, the stencil enables users to implement smaller apertures and thicker stencils. Reflow oven supplier BTU International has increasingly developed products for the solar manufacturing market in recent years, both silicon and thin film. The company is also rolling out new products for the traditional electronics market. Paul Van Der Wansem, chairman, president, and CEO, BTU, explained that solar makes the electronics sector stronger, both with R&D sharing to enhance products in both markets and with global infrastructure improvements to the electronics supply chain. Aspects like better temperature control and oven power can benefit electronics manufacturers and photovoltaics producers, perhaps in the same EMS or OEM factory. Look for DEK’s cover story in the upcoming May/June issue of SMT for more on the convergence and collaboration between electronics and solar manufacturers, including how solder print technology can be adapted to improve metallization on the surface of photovoltaics, improving current-carrying capacity and minimizing the shading effect on cell efficiency. Every inch counts on the manufacturing floor, and waste — be it spoiled solder paste, overstocked components, or wasted space — is not tolerated in a working lean production facility. This year at the IPC APEX Expo in Las Vegas, we saw several approaches to saving space, cutting down inefficient work in progress (WIP) bottlenecks, and increasing productivity in electronics assembly and test. For electronics manufacturers who will be scaling back expansion plans, trying to utilize existing space rather than invest in additional facilities or buildings, smarter conveyors, workstations, and storage solutions are in order. Movement of product through a facility can make or break lean goals. 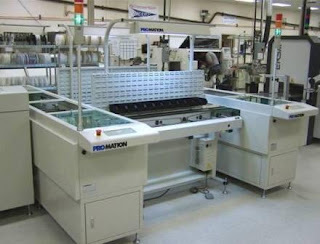 PROMATION Inc. demonstrated a dual-operator hand insertion solution with programmable slide shuttles for auto routing and PCB introduction into a selective soldering system with underside return (see image). The design enables higher utilization of floor space and personnel, said Gary Goldberg, president. It eliminates waiting time for the operator and is flexible. For optical inspection, the PCBs come in to an operator workstation. If it passes the board is sent to reflow. If it fails, a conveyor will take the board to rework. They automatically return for post-solder inspection. An AOI system can replace the operator workstation, activating pass/fail without operator intervention. The wrap-around design can be modified to suit any volume or number of operators, and all of the lifts, conveyors, and workstations involved are PROMATION components. Considering how many facilities have inspection, rework, and soldering in three distinct areas, with parts moved from one to another, this smart design can eliminate wasted time and space. Ken Bliss, president and Shana Bliss, sales manager at Bliss Industries Inc., discussed the FLEXconveyor, a flexible box build factory on wheels has multiple patents pending on its flexible platform. The conveyor is designed to be able to bend up to 90° and features quick-clamp connectivity, the ability to support a 19" rackmount chassis, and can be configured without the use of tools or bolts. Users can start with as small as a 10 × 8 ft line and add on other sections and elements, such as the flexconveyor pickup station. The metal parts are zinc-plated with ESD-safe drag chain. Locking casters hold the completed conveyor configuration in place. “The goal is to relieve bottlenecks and eliminate waste in production lines,” says Ken Bliss, adding that it meets the modern assembler’s need to change the line on the fly and increase production rates. “We configure exactly what a customer wants, visually, on the computer system,” said Shana Bliss. “They can see the details of how the line will work before the final quote, and four weeks later, units are shipped to the customer. The same driver who delivers the FLEXconveyor or any of our other assembly systems is the person who will set it up in 1–2 hours typically for a 50,000 sq.ft. factory.” When a new job is brought in, or volumes change, the conveyor sections can be unlocked and rolled into new positions, occupying a given amount of floor space in the best possible workflow. 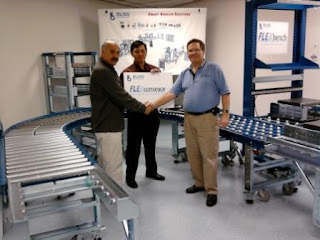 At APEX, Bliss announced that OnCore Manufacturing Services, an EMS company in the defense, medical, and industrial markets, tested FLEXconveyor in five facilities and plans to deploy it into all of its locations nationwide. This is the first installation of the new box build conveyor. Inventory kills lean, so the saying goes. However, there are some products that must be kept in stock, such as stencils, board fixturing, wave solder pallets, etc. And when inventory does come into the factory, dealing with it efficiently can save from incoming inspection to rework/scrap. DEK has a product to minimize the footprint of stencil storage. The Vector Guard stencil fixturing system is a model for looking at tooling less as a consumable and more as part of the factory floor. The fixed frame and interchangeable foils stencil holder uses vacuum — via a simple air pump — to tension the stencil onto the frame. It holds position and tension better than mesh-mount designs, said Brian Lau, GM of the Americas and David Byrd, U.S. operations manager at DEK. It also frees up an enormous amount of storage in the stencil holding area, as one frame is reusable and does not have to be stored with the foils. To make adoption easier, the air-tensioned VectorGuard can be cleaned like a mesh-mount stencil, can be used with the same variety of stencil foil materials, and integrates easily into printer platforms. When dealing with incoming inventory and kitting, flexible and value-added storage products can enhance the final assembly reliability, throughput, and traceability. Component storage involves one part to one location, said Ron Wrable, director of sales, Inovaxe. The company’s products manage WIP inventory by assigning each product a barcode and combining Web-based software as a service (SaaS) INOVISION and INOKIT with on-floor component storage, kitting, and delivery system INOCART. AN INOCART MSD also is available for moisture-sensitive components (MSDs) that will be compromised by time spent unprotected in the factory environment. Other MSD cabinet makers, such as Totech, explain that desiccant cabinets simplify inventory management logistics, since components can stay in tape-and-reel storage, and the added step and capital equipment investment of drying ovens are circumvented. Totech’s MSD storage cabinets can be configured as simple component stocking areas, MSD dryers (desiccant and low heat), or N2 environment storage. “When MSD cabinets are not in use they are not wasted space,” agreed Michelle Ogihara, sales and marketing manager, Seika, pointing out that “the McDry cabinet is designed for MSD electronics, so its recovery time is faster and its relative humidity (RH) settings are very precise. However, when MSDs aren’t in stock, it can be plain component storage, with the ergonomic design and adjustable shelves aiding manufacturers even without baking or desiccant features in use.” Understanding the range of customer needs and facility designs, McDry is manufactured in tabletop size, feeder-storage capacity, up through very large units. “WIP is killing U.S. assemblers’ efficiency,” said Ken Bliss, while discussing the future of the American electronics manufacturing plant. Rather than changing the plant’s address — either to a larger facility or to an offshore location — first consider what can be done to make product flow better from incoming inventory to final assembly/box build. Did you notice the lower volume of attendees at APEX this year? For an editor, this gives us more time to interview exhibitors, conduct panels, talk to leaders in the industry, and grant awards for innovative new products and services. For those involved in shipping large pieces of equipment and flying sales staff to Las Vegas, the experience takes on a whole new atmosphere. Although crowds were thin on the show floor  Denny McGuirk, president of IPC, estimated 20 to 25% down in registrations from last year  those seeking an education filled up the technical sessions. Education makes employees more valuable to any company. No one doubts that business in the U.S. has limped through a weak period. And in electronics, recent news revealed IBM’s Project Match, which offers laid-off U.S. and Canadian workers the chance to apply for jobs at the company’s India location and other areas of low-cost labor around the globe. IBM would help with visas and moving costs, but the salaries would be the same as those within these low-wage areas. Who would jump at moving somewhere else globally to earn less? At having themselves “outsourced” along with their job? Most of us drag our feet at moving between U.S. states for increased income. Let’s face it, this is a flat year globally for most EMS providers and OEMs already. Most industry analysts project negative growth, if any. And survival can spur life changes; that is certain. Employees working at IBM in the U.S. must have known about the Wall Street Journal’s story last month announcing that IBM planned to lay off 5,000 U.S. employees with many of the jobs being transferred to India. Foreign workers account for 71% of IBM’s nearly 400,000 employees at present, WSJ said. If it’s a global economic change, then we already know about that. The question is, are we improving the lives of individuals by taking them away from their neighbors, families and homes only to pay them a lower wage? What would be the difference if foreign workers came to places where wages were higher, but families were distant? The problem with outsourcing employees is that all good business decisions are often poor choices for people. As people, do we raise the middle class if we lower incomes? Do we strengthen families by separating them? The APEX Question: How Much Money Can I Save? Cost is the main theme at APEX this year, which is no surprise. The electronics manufacturing industry doesn’t exist in a vacuum, and everyone is seeing the decline in global spending and production. Suppliers are designing systems for assemblers that are both low investment up front — we’ve seen entry-level machines showcased at the booths more than new high-end ones — and low cost of ownership (COO), meaning the operational costs cut out inefficiencies or long downtimes, high energy use, and other undesirable side effects of electronics manufacturing. Shopfloor management software that enables truly lean production is getting a lot of attention at APEX. As one exhibitor put it, attendees are asking “How much is the machine? And how much will it cost me to run it?” With capital equipment spending dwindling, vendors must get the answers to both of those questions right. Sunstone Circuits and partners National Instruments, Digi-Key, and Screaming Circuits gathered at the show to discuss their ECOsystem product, which brings PCBs from design through sourcing and manufacturing in one cohesive supply chain. Design for manufacturing (DfM) was the theme at JTAG Technologies’ booth as well, where they discussed the possibilities of utilizing boundary scan from first prototype through PCB test through in-field service to cut down prototype iterations, make service less invasive, and increase yield. JTAG refers to this as DfTALES, which means design for test, assembly, logistics, engineering, and service. The manufacturing execution software (MES) suite from Valor also incorporates DfM, along with machine integration and inventory management to detect and call out inefficient or out-of-spec processes. Valor just surpassed the 800 customer mark globally. Juki debuted a shop-floor management software program, Intelligent Shop-floor Solutions (IS), to complement its component placement and selective soldering machines at the show. Aegis released the third revision to its Version 7 manufacturing operations software (MOS), called R3. This also is designed to cut costs through maintaining peak efficiency and streamlining operations in everything from screen print to thru-hole insertion to box build. Without a main computer interface, and with operators interacting with the MOS suite verbally, R3 targets a less skilled, less trained workforce on the line, cutting out that monetary burden. Aegis’s R3 system was recently selected by Sanmina-SCI to go into about 20 facilities globally. Sanmina has installed the system in a handful of assembly plants and approved it for company-wide deployment. Maximizing the effectiveness of equipment and people saves users from investing in new machines, which likely isn’t an option for many assemblers in 2009. Equipment providers can found innovative ways to cut costs as well. Aqueous Technologies, which recently acquired the Austin American Technologies MicroJet defluxers, pointed out that the in-line defluxers stagger the force, or energy, of the wash to remove flux intelligently rather than blasting it with cleaning solution indiscriminately. This means the machine requires a smaller motor, less energy draw on the factory floor, and therefore a smaller footprint. Aqueous also redesigned its Zero-Ion cleanliness tester and in doing so reduced the purchase price. Inspection system manufacturer Koh Young brought its lower-priced machines to the show, KY8030 series, which typically target manufacturers in China. With a primarily North American attendance base at APEX, this seems like a shift to more cost-conscious purchasing at domestic manufacturers. Essemtec showed a full suite of screen printers, component placement systems and reflow oven at APEX, but they were also promoting the company’s stability, with a fully owned manufacturing plant in Switzerland and no debt/good credit. One has to believe this reassuring tone is prompted by the bankruptcies and shaky footing of major companies all over the world, such as the “Big 3” U.S. auto makers. Siemens introduced the Siplace CPP MultiStar placement head, which switches on-the-fly between high-speed and pick-and-place modes. It effectively eliminates the need for both a chipshooter and an end-of-line pick-and-place machine, performing the tasks of both. Placement “silos” that lack this range slow the production line down and have the added burdens of machine downtime, underutilization, maintenance, etc. The MultiStar head’s flexibility brings it beyond the silo model, yet maintains the accuracy found in dedicated machines. Solder recovery systems supplier EVS International highlighted the COO advantage of investing in a dross recovery system. Users can cut solder purchasing by 40% in some cases, representing a huge savings in consumables. The system also brings dross management in-house, eliminating a step in the EMS/OEM supply chain that was not controllable by the manufacturers. CeTaQ Americas, which manufactures machine calibration equipment, emphasized the importance of running in-spec and at top efficiency in an era of tight profit margins. Keeping a paste printing machine at its best level of performance will extend the system’s usefulness and lifetime, delaying investment in new capital equipment. CeTaQ offers all of its equipment as a service as well as for purchase. Inovaxe also highlighted lean as a way to save money and reduce costs at the assembly house. Inventory management is central to this philosophy. The company showcased its software as a service (SaaS) options, which allow users to track incoming and in-process inventory, eliminate spoilage, and protect sensitive components like moisture-sensitive devices (MSDs). In 2009, manufacturers must find ways to cut out non-value-added time, making each job as profitable as possible. Human effort can be the largest consumer of non-value-add time, and Europlacer highlighted its camera-based footprint programmer on the inneo placement platform as an example of technology replacing human effort. Parts profiles are obtained via a camera and programming in the inneo system, freeing up operators who would otherwise be drawing in the parts. This also enables more job changeover and more job runs with less downtime. Cost is by no means the only story coming out of APEX this year. Emerging markets, such as photovoltaics manufacturing, are becoming a complementary focus for some assemblers, and equipment and materials providers are supporting this change. Counterfeit electronics are a hugely important topic, and many new products, from advanced labels by Polyonics Inc. to XRF analyzers by RMD, are coming out to combat the problem. Inspection remains an evolving realm, with some players exiting and others getting more involved in this sector. And the industry can still have fun in bad economic times, as evidenced by the informally dubbed APEX band, which gathered toward the close of Day 1 to play a few songs. SMT will continue to cover the trends from the show floor at APEX on our Website and in our e-newsletters and issues following the show.